I am not a romantic movie hater but Bollywood has lately started irritating the audience with their love stories. I watched Sanam Re just 3 months ago in hope of finding some great cinema as it starred Pulkit, Yami and Urvashi- some faces from new generation. But it made me hate myself more for choosing such a movie to watch. 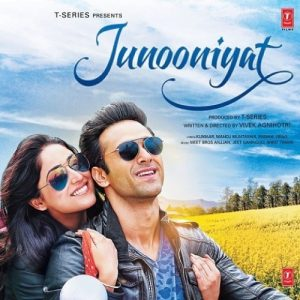 The history has repeated itself again as I ended up watching "Junooniyat" expecting the lead actors for not making the same mistake again in a love story. But there are few actors who do not have problem in repeating mistakes. It seems Pulkit and Yami are just interested in working with each other than anything else. Though they call the gossips of their intimacy a rumor but seeing both these movies doesn't want me to believe that they aren't. Huh! The story of Junooniyat is the same cliche that we have seen a lot in 1980s and 1990s. Even in early 2000s but the director, Vivek Agnihotri, believes that his movie is different with the same script in late 2010s. The story starts with showing Yami swimming in a restricted area where Pulkit goes to save her. After some initial arguments and war of words, both of them realize that they are in love. But then just like 1 crore Bollywood movies, the girl's father is against this love story as the boy is working for Indian army. The problem is that the old man have already lost his two brothers and a son in the duty. He doesn't want his daughter to face the same tragedy again. But our hero believes in choices and not in destiny. But the circumstances wants him to believe otherwise. And that's what Junooniyat is all about. The biggest problem with the story is that you will keep searching for the passion in the love between our hero and heroine but you will not be able to find it even in a single screen. Yes, there are tears like anything but nowhere passion can be seen between characters for each other. Even when they meet each other unknowingly after a break of time, they are unable to show the passion. Pulkit Samrat have managed to bring 75% of his screen space to shine but the script and the barriers to his character have held him back in bringing this movie to a level where it can be called watchable. Yami is just imperfect for this role of a Punjabi girl who is very bubbly and playful. The direction, script and everything is bad in this movie except little bit of Samrat. For him, I give this movie half star out of 5. And yes, yes, yes, songs are soulful and something that will make you remember this movie even after years.